Singer/songwriter/song stylist Raspin Stuwart’s life and career can best be described as a Tale of Two Cities – Chicago and Los Angeles, that is! However, these two cities are just starting points for a performer with truly universal appeal..
Born and raised in the Chicago area, Raspin was surrounded by the influences of the blues and jazz music greats of the era, as well as the popularity of the singer-songwriter music genre of the 1970s that begat one-of-a-kind talents such as Joni Mitchell, Bruce Springsteen and Cat Stevens. His music is equally informed by the entirety of his adult life in Los Angeles, measured by his professional successes over the decades since arriving in the City of Angels to seek his fame and fortune at the tender age of 17. Like the music heroes who today remain relevant, serious music lovers of all ages relate to Raspin’s performances, his complex and intriguing lyrics, and inspired covers of classics. Raspin’s emotional vocals, striking lyrics impact brightly on the listener, a stark contrast to his hypnotic melodic background. As evidenced on his new CD, NY2LA , his eclectic mix of theatrical, captivating and soulful music provides the perfect follow-up to his critically acclaimed, Starbucks-endorsed CD, We Do What We Do. Tracks on his NY2LA include a reggae version of “Smoke the Hookah,” the jazzish “New York 2 L.A.,” “Love Along the Way” (a unique pop hybrid rooted in the 1960s), the soulful, down-home warmth blues of “Mama’s Got the Blues,”. Keeping Raspin in demand after long ago establishing himself in the music world is the fact that he remains the newest and freshest “veteran” musician, singer, songwriter and song stylist working today. His appearances at NAMM (National Association of Music Merchants) in recent years, as well as his inclusion in the stellar lineup for Southern California’s Make Music Pasadena concert at Levitt Pavilion Pasadena, underscore his continued relevance in these unpredictable times, are the latest high points Raspin’s unique style allows him to be right at home anywhere, from the smallest, intimate theater to an energetic blues club. Raspin was the opening musical performance for author Marianne Williamson, and has been described as “a music guru... who makes us think,” by the Life Changes Network BBS. His fans are mesmerized when they attend his live shows and absorb his soulful music into their hearts and minds. To sample this remarkable new track and share it with your audience, simply reply to this email with instructions on how to send it to you. Acoustic folk pop, jazz, R&B, sprinkled with a touch of gospel and reggae – there’s something for everyone on the 10 tracks of this amazing album. Five years in the making, Raspin creates a style of his own borne out of a spontaneous energy that defines his stylized original vocal and performance trademark. Lustful and daring, NY2LA, boasts a new pallet of work while revisiting his most powerful past collaborations to weld into a senses-shattering reassurance that things really aren’t all the different from past times. Accept they are! 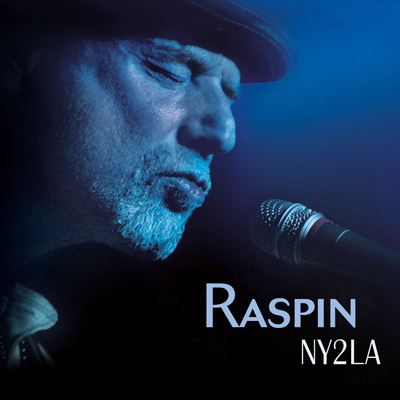 Visit www.raspin.com for more information, and immerse yourself in a senses-shattering experience with NY2LA.